Advocatus Atheist: Pity the Atheist? Why not Pity the Christian Instead? 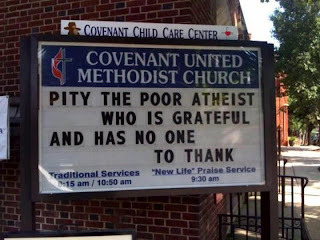 Pity the Atheist? Why not Pity the Christian Instead? Why should we pity atheists again? 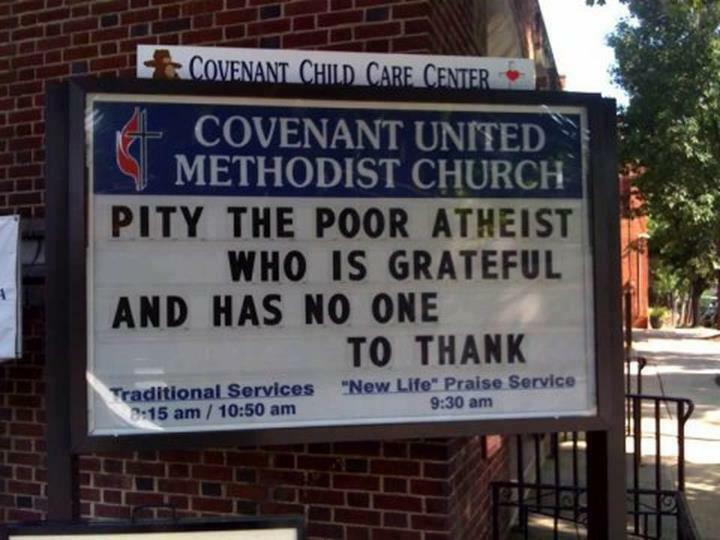 According to the Covenant United Methodist Church it is because they [atheists] are unburdened by the unlawful demand to give mandatory homage and venerate a megalomaniacal deity who doomed his own son to death and forced everyone to be grateful for his doing so. How is not having to submit to such a ridiculous, unfair, and immoral proposition a pity? I pity the Christian who thinks that their God is "love" and that Jesus' sacrifice meant anything let alone was actually a good thing. Twisting evil things to mean good things, and sanguinary acts to be righteous is merely a distortion of terminology--it's a type of semantic trickery meant to dupe the weak minded. John 3:16 is a perfect example of this backwards, irrational, type of thought. "For God was so indifferent to the sanctity of life that he first damned all life and then divined a plan to forsake his own Son's life, and thereby, in treacherous scheming, shed his son's blood so all those who God had previously damned might worship him for the price of their eternal salvation through vicarious redemptive blackmail... or else perish." Not all that loving or moral of a plan when you stop to actually think about it. At best, the Christian faces the unfair Catch-22 of not being allowed any other option but to worship God and obey God's obligatory call to love him (and only him--he is a jealous God, after all) because he so "loved" the world first. Except, by God's acts, we know that he did not love the world in totality. He first damned the sons and daughters of the world and then called it his love that he might blackmail his followers into worshiping him for the price of their souls. Worship me, says God, and get your soul back. Refuse, and spend eternity in hell, where you will be going anyway, if you fail to worship me in the first place. But why would the failure to worship God result in our inevitable doom? Because we are damned. Who damned us? God did! Unlike Allah, the Muslim God, the Christian God was incapable of Original Forgiveness. He was only powerful and intelligent enough to devise Original Sin, and after that, God's divine plan, if one could even call it that (seeing as how limited it is), regressed back to a primitive form of barbaric Bronze Age blood sacrifice. Original Forgiveness, apparently, was just too impossible a concept for the Christian God. Perhaps worse still, is the Christian is forced to sin, otherwise the blackmail has no legitimate meaning, since it only works against so-called "sinners." Which is the reason why God damned everyone with the curse of ancestral sin from the beginning. It's not enough that Adam and Eve were punished for their sins, but you'll be punished for their sins as well. Anyone with a 21st century understanding of ethics will tell you how morally bankrupt it is to hold the entire race accountable for the crimes of just a few. We don't hold all Germans accountable for Hitler's Holocaust. Why would we hold all of humanity accountable for the crimes of illiterate teenagers at the dawn of civilization? (This is granting that the story of Adam and Eve is an accurate account of Original Sin--I do not believe it is at all a literal account, much less historically viable, but Christians deem it so, so on their word the question of God's so-called love hinges, once again, assuming God exists anything like the Christian conceptualization. I think not, but for the sake of argument, and to show the invalidity of Christianity, we must look at the feebleness, contradictions, and irrational platitudes of the whole theology, as if Christianity actually had a leg to stand on. By knocking those legs out from under it, we demonstrate that it is not legitimate--and instead all one is left with is a house of cards collapsed in on itself). The fact is, Original Sin, and the sacrifice required to cleanse us of it, is an immoral proposition to begin with--and anyone who thinks otherwise simply hasn't thought it through. By using our natural conscience against us, God uses our feeling of guiltiness to convince us of our wrong doing(s)--to convince us that there is no hope without proper redemption. What God apparently forgot to realize is that a truly corrupt and sinful being wouldn't have any inkling of goodness to feel remorse or guilt in the first place. Only a inherently moral creature could be so inclined. Thus God's ultimate plan is to ruin and enslave the human race to his malicious will, not actually help us to flourish or realize our true moral potential. That's not a God any thinking, rational, or compassionate human being would ever desire to worship.